Zoe, the only girl hanging with her beautiful mom Olivia. From our Olivia vom Vollkommen, Dasty Emsi-Haus litter. New puppies have arrived at vom Vollkommen kennels! For information on Cora's male puppies or other upcoming litters please contact us! Litter Announcement - Dam: SG1 Rajka vom Vollkommen IPO2 "a" normal hips/elbows, Sire: V1 Voodoo vom Kuckucksland IPO3 KKL1 LBZ. We are now accepting deposits! 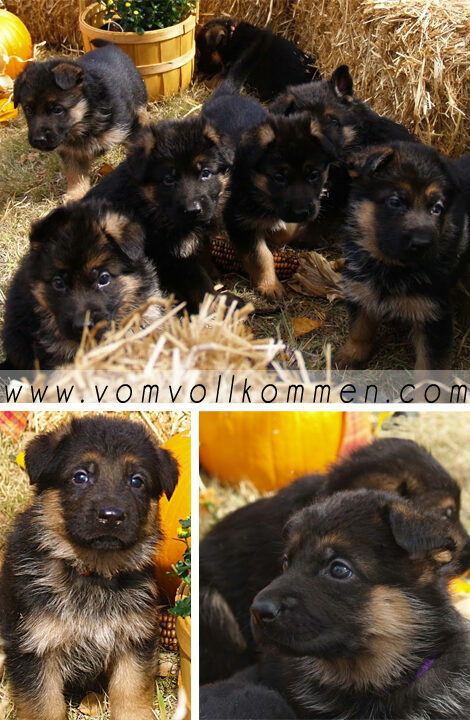 The boys, Zack, Zyden, Zeus, Zeke, and Zorro from our Olivia vom Vollkommen, Dasty Emsi-Haus Litter. How cute! It's puppy playtime at vom Vollkommen kennels! For information on current puppy availability please contact us. Rajka's new German Shepherd puppies have arrived! 6 males are currently available from this litter. For more information on these adorable pups please contact us. New puppies have arrived at vom Vollkommen kennels! For information on Nataly's recent litter or other upcoming litters please contact us! Dasty Emsi-Haus will be competing in the Working Male Class at the 2018 German Shepherd Dog Club of America Sieger Show in Zion IL, Sept 27-30th. Fall has arrived and the puppies from our Rajka & Voodoo litter are loving it!